It seems that lately there have been several new CD's that have found their way to the Ambient Visions mailbox and some reviews of these titles are well deserved. 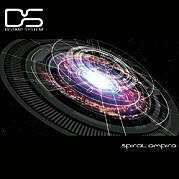 Spiral Empire by Distant System caught my ear from the very first play and I'm sure it will be in my CD player long after other releases have disappeared from my rotation of listening. Distant System is actually producer Tyler Smith aka Quasga who has also released music as Androcell. Tyler is described in his bio as an electronic dub/pyschill artist and even though that was written to describe his efforts as Androcell I think that it is a fitting description of his latest incarnation as Distant System. Ambient Visions is always trying to bring great music to the attention of our readers and as many of my long time visitors already know that music is not always drifting ambient or deep space music anymore but rather it is anything that is quality and would be of interest to those who have frequented this website over the past 9 years. Spiral Empire is one of those CD's that treads a wonderfully fine line between elements of ambient and a rhythmic, pulsing atmosphere that moves each track forward allowing it to be relaxing and at the same time an engaging composition that makes you think about what you are listening to. The laid back grooves of these songs never overwhelm the overall chilled atmospheres of these 8 tracks but they are bouncy enough to keep your foot tapping throughout. Spiral Empire has a theme of space and time that ties the songs on this CD together into an organic whole so that the listener moves from one track to the next and while each composition is a unique selection it also lends itself to the project as a whole. With songs titles like Gravitational Vortices, Outer Rim, Cloud Nebula and Astromech Starport you get a feel for where this journey is going to take you. There is a decidedly electronic feel to the instrumentation with a shifting variety of sounds and effects to keep the mind anchored in the vastness of space during the trip so that all of the soundscapes that are created support the sonic pallette that Tyle is painting upon. In other words from the beginning of this CD to the end all that you hear allows the listener to experience the rich environment of space. I also like what Tyler does with several of the songs either at the end or at the beginning of the track he will let the listener float along in something that is very much an ambient type atmosphere with drifting synths and sound effects but no beat. It is a marvelous way to allow the listener to wind down just slightly in between the songs and feel the loneliness of space and the feeling of floating amongst the stars. And then almost as soon as you get used to this weightless feeling the beat returns, gravity exerts its grip on you and you are thrust back into an active listening mode. If you want to listen to what I am talking about check out the end of track 7 which is called Cloud Nebula as it morphs into track 8 which is called Atromech Starport. I'm sure you will agree that it is a wonderful melding of the ambient and the chillout styles of music that are intertwined throughout this CD. After listening to the CD several times through I have yet to find a weak track among the 8 songs that comprise this release. The CD clocks in at just over 62 minutes so it gives itself plenty of time to pull the listener into this sonic adventure and once there to show them the sights of this strange and mysterious landscape that they have been transported to. The CD was matered by Huby Sea and Vincent Villuis over at Ultimae which explains why it has such a smooth feel to the whole CD and why the quality is consistent throughout the CD. The only track on this CD that is not completly Tyler Smiths is Track 5 called Time Circles and from the notes it appears that this track first appeared on an Ultimae release and is the only track that was not written and produced by Tyler Smith on this collection. Tyler gives it his own spin though as he remixes it on this CD as well as doing some additional production work on the track. To sum up what I think of this CD...I like it alot. It doesn't wear me out after repeated listenings and better still it doesn't put me to sleep either. Don't get me wrong there are many CD's that I put on just to drift off to sleep by but not all of my music listening has the goal of allowing me to nod off to sleep. Many times I like to actively listen to my music and enjoy each and every song that pours out of my speakers. Spiral Empire by Distant System fills the bill for me when it comes to listening and enjoying what I am listening to. Tyler manages to interweave the currents of these compositions and allows them to ebb and flow during the course of this CD. Tyler Smith's debut release under his new moniker of Distant System works very well and remains consistently good throughout. It does not disappoint the listener at all and it does deliver on presenting an enjoyable and well crafted debut release for Celestial Dragon records. Hopefully there will be many more to come. Highly recommended by AV. 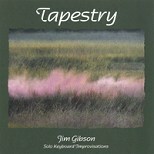 �Tapestry� is Jim Gibson�s sixteenth album since 1996, and his first of all-original material. His previous releases of �cover� music have been marketed mainly to gift shops, historic sites, tea shops, and a mix of other kinds of specialty shops. In the course of doing commissioned work for a DVD about tea, Gibson rediscovered how much fun it is to create music, hence his newest release. All fifteen tracks are improvisations, and this time Gibson chose to record on keyboards rather than a grand piano, utilizing a variety of keyboard sounds. The son of a piano teacher, Jim Gibson grew up playing music. He started playing in dance bands in college, going on to teach English and college Music Industry classes; he worked as a writer/photographer for the Georgia Department of Education, and then started working as a commercial pianist some thirty years ago. Gibson�s goal is to create music that is simple, direct, and relaxing, endeavoring to reduce the noise level in people�s lives. His cover music is also improvised, and is generally assembled by themes such as hymns, music of the South, movie and Broadway music, and even music about tea. The music on �Tapestry� is quietly soothing, unhurried, and warmly inviting. It is also an unobtrusive musical backdrop for working, dining, and unwinding. The appropriately-titled �Wistful Moment� begins the CD, setting a gentle, dreamy mood. The title track, is a study in pastel-tinted sounds woven together into an elegant whole. �Hidden Pond� is one of my favorites, hinting at Satie-like simplicity. �Solace� is played with a rich guitar sound that is gently soothing and very peaceful. �Blue Valley Dawn� is another favorite with its quiet grace and optimism. �Simple Song� resembles a children�s song with its innocence and openness. �Pensivity� returns to guitar and sounds like late-night musings by candlelight. �Sandra�s Waltz� is a beautiful slow dance under the moon, a graceful reverie. �Slowdown� is a bit more abstract and unstructured, bringing visions of light dancing on tranquil water or maybe ripples in a lazy stream. �Windchimes� is also lovely, with images of a spring breeze invoking the occasional harmonies of beautifully tuned chimes. �Dappled Light� closes the CD with a gem that moves at its own pace, much like light moving through shadows, seemingly random, but quite purposeful after all. It is always great to hear that a lifelong musician has found a different direction, and �Tapestry� is a good indication that Jim Gibson is on the right track with his new endeavors. This and Gibson�s other CDs are available from www.hickorycovemusic.com, cdbaby.com, and amazon.com. Recommended for quiet times and for soothing background music. 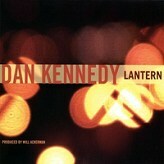 �Lantern� is pianist/composer Dan Kennedy�s debut CD. The 19 1/2-minute, four-song CD was produced by the legendary Will Ackerman at his Imaginary Road Studios inVermont. Recorded on the studio�s Steinway Model B grand piano, the CD also features Glen Velez on percussion, T-Bone Wolk on bass, and vocal colors by Samite and Noah Wilding. Kennedy is on the Theory and Composition faculty of Westfield (MA)State College and has had five chamber works published by Dorn Publications. Largely self-taught, Kennedy studied classical and jazz piano and blends those two styles exceptionally well. The music on �Lantern� is a deeply heartfelt exploration of the balancing of energy and stillness, and this juxtaposition works well musically. The music has a sense of movement and aliveness, yet it looks inward and conveys a feeling of serenity. The four pieces are quite different from each other, giving us a look at various styles of Kennedy�s compositions. �Dulcimer in G� is the liveliest of the four tracks, with piano, percussion, and wordless vocals. Enthusiasm and excitement flow through the piece like an electrical current, but the subtle voices keep it grounded. A joyful, swirling dance, this is a great introduction! �Ballad� is much quieter and more introspective. By definition, a ballad is a piece that tells a story, and this one seems to be one of sadness and loss or hurt, told as a late-night soliloquy for solo piano. �Dear Girl� is also solo piano and is composed in two themes that make interesting use of grace notes. They form their own repeating pattern or theme that�s a little bit �folkie� (a la George Winston or Philip Aaberg) and a little bit jazzy - an intriguing piece! �Cycle,� begins with just the piano, evolving into an ensemble for piano and voice. Sometimes quite energetic, sometimes calmer and more pensive, it illustrates the changes as well as the repetitions in various cycles of life and nature - a beauty! �Lantern� is a fresh and fascinating introduction to Dan Kennedy�s music that definitely leaves the listener wanting more. It�s a real bargain at $5.99, so check it out at www.dankennedy.us, CD Baby, and iTunes. I can�t wait to see and hear what comes next! 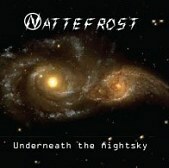 Though Nattefrost � the pseudonym of Bjorn Jeppesen -- has been around since 1995 Underneath the Nightsky is only his third full length album. Utilising both software and hardware synthesisers he creates sequencing based music with hints of Tangerine Dream and Jean Michel Jarre. Most of the album is his compositions except �Winterland� which was co-composed with Robert Schroeder-Trebor. An intro of lapping water, brief chorales, a drone, and a female voice narrating something in German lead into a pulsing sequence in the opening track �Translogical Movements�. The pulse moves back and forth like a minor doppler effect while retro style refrains add a feeling of sideways movement. Eventually this gives way and the sequencing is complemented by squirty effects. Breaking the sequencing mould for a short time is �Searching for a Distant Planet�. A mid-tempo bass and percussive rhythm is accompanied by industrial-esque hammering. Further in the piece develops into tight sequencing. Tangerine Dream have a lot to answer for. Due to being pioneers in the world of electronic music they've made sequencing something which many artists aspire to. Nattefrost's album is not retro yet this kind of work harks back to times past. What Nattefrost has done right is to use sequencing in different moods and styles. If I had to use one word to describe this album it would be �vitality� because most pieces have plenty of energy. If an album chock full of sequencing floats your boat then Underneath the Nightsky is surely worth checking out, but it's appeal outside this genre is probably limited.